This is a question frequently posed by creationists—and quite often by perfectly rational people. It betrays a common misunderstanding of how evolution occurs. In this particular case, the answer also depends on what the questioner means by ‘monkeys’. Human beings did not evolve from modern-day monkeys; human beings and modern-day monkeys both evolved from an extinct common ancestor (which was also, colloquially speaking, ‘a monkey’). In the huge evolutionary family-tree of all the species that have ever lived on earth, humans and modern-day monkeys are close, living cousins. My father’s father died many years ago, but he left quite a few living descendants, including me, my sister, and my paternal cousins. To ask the question ‘If humans evolved from monkeys, how come there are still monkeys?’ is a bit like asking me ‘If you are descended from your grandfather, how come your cousins are still alive?’ The question doesn’t make any sense: why shouldn’t my cousins still be alive? As I said, asking the question ‘If humans evolved from monkeys, how come there are still monkeys?’ betrays a common misunderstanding of how new species evolve. The question seems to assume any new species must always replace its parent species. Presumably, the questioner is under the misapprehension either that: (a) parent species always evolve in their entirety into descendent species; or (b) descendent species always out-compete their parent species, driving them to extinction. Neither of these assumptions is correct. If they were correct, the total number of species on the planet would never increase, and the ‘family tree’ of species would not be a tree at all, but a vast collection of entirely separate lines (or ladders) of descent. In reality, parent species can spawn several child species, thereby initiating an entire ‘family tree’ of descendent species. New species usually arise when a relatively small sub-population of an existing species becomes isolated from the rest of the species in some way, and diverges genetically from the parent population. Circumstances will differ from case to case, but the main cause for this genetic divergence will usually be the two populations’ continuing to adapt to their different environments through Darwinian Natural Selection. But even if the selective pressures in the two environments are very similar, the fact that the two populations are isolated from each other means some genetic divergence is bound to occur. Random changes in the genetic make-up of the two different populations mean they will drift further and further apart over the generations. If the two populations continue to diverge, and remain isolated long enough to prevent inter-breeding, they will eventually become so different from each other that they can no longer be considered to be the same species. Separation leads to divergence leads to speciation. So did we evolve from monkeys or not? As I said at the beginning, it depends on what you mean by ‘monkeys’. Modern-day ‘monkeys’ comprise two distinct groups: the Old World monkeys (living in Africa, Asia and Gibraltar), and the New World monkeys (living in Central and South America). These ‘monkeys’ form part of the simian family tree, which also includes modern-day apes and us humans. Around 40 million years ago, a new sub-population branched out from the simian family tree. A small sub-population of this new branch—a twig, if you will—eventually crossed the (much narrower in those days) Atlantic and evolved into the modern-day New World monkeys. The rest of their branch remained in the Old World and eventually became extinct. The main section of the simian family tree, from which the New World monkeys’ section had branched out, branched again around 25 million years ago. One branch eventually evolved into the modern-day Old World monkeys, the other into the apes (and, eventually, us humans). Somewhat counter-intuitively, therefore, humans and Old World monkeys have a more recent common ancestor (i.e. they are more closely related to each other) than Old World and New World monkeys. This, perhaps surprising, conclusion is backed up by masses of morphological and genetic evidence. For example, humans and Old World monkeys have the same number of teeth; New World monkeys have an extra set of premolars. So, how do you define a monkey? You could quite reasonably argue that, if modern-day Old World Monkeys are ’monkeys’, and modern-day New World monkeys are ‘monkeys’, then it stands to reason any species descended from their most recent common ancestor must also be ‘a monkey’. But, as we have seen, that includes us. In which case, not only did we humans evolve from monkeys, but we still are monkeys! But you might equally reasonably choose to exclude humans (and apes) from your definition of monkeys. In which case, the colloquial word ‘monkey’ (as used to refer to both modern-day Old World and modern-day New World monkeys, but not humans or apes) becomes scientifically meaningless. In which case, the original question is also meaningless, as, scientifically speaking, there is no such thing as ‘a monkey’! There is a difference between evolving and being a descendant. Evolution is descent with inherited variation. The fact that we and modern apes and monkeys are not all the same species, but are both descended from a common ancestor, means that evolution occurred. The force driving Evolution is not purpose, but beneficial error Thus Life, intelligence, and consciousness are the results of some dandy screw-ups. My question is this. If we are descendants then would DNA be the same? And if not then couldn't we have come from just about any living "species"? I know that human anatomy is very similar to the modern day cat. You use the example of the grandfather. I do not see how that has anything to do with evolution nor the fact that there are different races of people. It is one thing thing to be a descendant from people but to evolve from something completely different is something else. David, you make a good point about DNA—although DNA is only ‘the same’ between identical twins. But, in the same way that similarity in DNA can be analysed to identify how closely two people are related (e.g. to identify a child's true father), similarity in DNA can also be used to identify how closely two different species are related. Many such tests have been carried out on all sorts of species. They prove beyond doubt that humans' closest living relatives are chimpanzees and bonobos. We did indeed evolve from apes. Indeed, depending on how you choose to define an ‘ape’, you could say that we humans are apes. 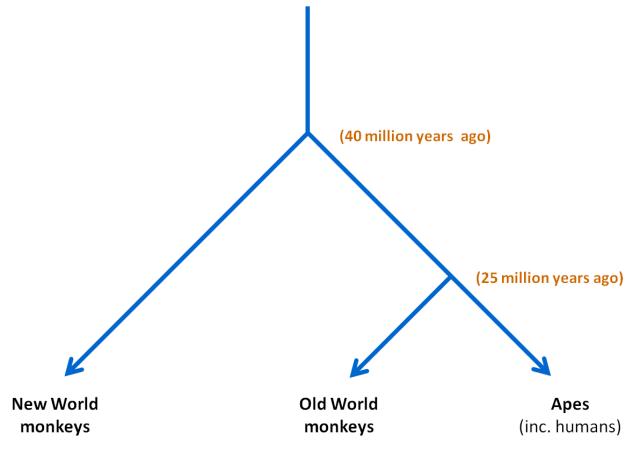 But, as I make clear in the article and diagram, the apes (including humans) evolved from ‘monkeys’ (according to some people's chosen definition of the word). Wow how fasinating and get more info of the new world monkeys. Thanks a lot. A message from Bacup, the other side of Dulles Gate. As you point out, not by the replacement of the parent by the child. However, our friend Charles' words betray the same misunderstanding. In the nicest possible way, get your head round that one. One question that I have been getting my ape head round for years is simply illustrated in your diagram. My long lost simian ancestor became old world and new world monkeys. From old world monkeys evolved apes, then human apes like me. Why did new world monkeys not perform the same trick? You could write a book on that. 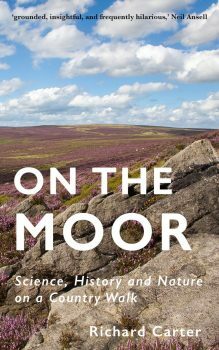 I don't think Darwin was necessarily all that far off when he said successful new species tend to see off their parent species and weaker sibling species, but there are no hard-and-fast rules when it comes to the elegantly clumsy process that is evolution by means of natural selection. As to why New World monkeys haven't evolved into something like apes/humans, there is no reason why they should have. Convergent evolution is a fascinating subject, but it doesn't always have to apply. (Like I said, there are no hard-and-fast rules.) Climate change (the drying of Africa, and its change from forest to savanna) is often suggested as an important factor in forcing our ancestors to adopt new lifestyles. Although South America has undergone similar climate-change in places, our not-so-distant cousins seem to have stuck resolutely to the Amazonian rain-forest. Humans are not more complex than apes. If you look at our DNA, we are over 98% identical. Chimps have evolved into chimps, and we have evolved into humans. We haven’t evolved any more than they have; we’ve just evolved differently. To judge chimps by human standards is to judge them unfairly. We are undoubtedly far more intelligent, but chimpanzees are much better at climbing trees. Who is to judge which is the better way of making a living? Being intelligent is undoubtedly very useful, but it comes at a high cost in terms of the amount of food we need to eat. Chimps have come up with a different way of living: no better than ours, no worse. Having said that, chimps are still generally reckoned to be the second most intelligent surviving species on our planet—which is hardly surprising, bearing in mind we have a relatively recent common ancestor. the Bible is not the oldest text out there. The Rig Veda, for example, is far older, and there about as much evidence substantiating its historical writings (more, now, with the advent of modern archaeology.) Most of their "proof" is not good science and much of it is just assertion. Also, the fact that the supporters of a theory may be normally rational does not mean the theory holds water.